Delicious meals from your food storage. Store what you eat and eat what you store. In a skillet, melt butter. Remove from heat and stir in flour. Add onion, water, bouillon, and half & half to the mixture. Cook and stir until thickened. Stir in cooked rice, chicken, broccoli, mushrooms, parsley, slivered almonds, salt, pepper. Put in an 9"X9" baking pan and bake at 350 degrees for 30 minutes. In a medium size bowl, cover freeze dried chicken dices with warm water. Let sit for 5-10 minutes or until softened and reconstituted. Drain. Preheat oven to 350 degrees F.
In a large pot of salted boiling water, cook egg noodles according to the directions on the can. Toss cooked noodles, gravy or soup, and milk in a large bowl with vegetables and onion until completely coated. Add salt, pepper, garlic powder, and thyme. Toss mixture with chicken and stir to combine. 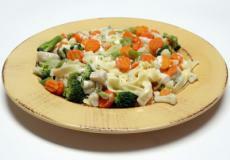 Pour into casserole dish and top with ½ cup Parmesan. Cover casserole with foil and bake at 350 degrees F until bubbly for 20 minutes. Take off foil and top with remaining ½ cup Parmesan Cheese. Bake an additional 15 minutes. Serves 6. In a 2-quart saucepan, brown bacon and drain off grease. Add water and bring to a boil. Or bring to a boil water and bouillon. Combine onions, milk, eggs, butter, tomatoes, mushrooms, and seasonings. Add to boiling water and reduce to a simmer. Add potato beads and stir well to incorporate. Turn heat off. Stir in cheese and let rest for 3–4 minutes. Stir and serve. Serves 4. Serving Idea: Try adding 1/4 cup sour cream at the end for even creamier potatoes. NOTE: May use diced ham instead of bacon. In a heavy kettle, either brown hamburger or add the canned hamburger and its broth. Add the various beans, corn and tomatoes. Drain the beans and corn, but do not drain the tomatoes. Add the onions, mustard, vinegar, sugar, salt and pepper. These ingredients can be adjusted to taste. Bring to a gentle boil, stirring occasionally to prevent scorching. Reduce heat to low and simmer for 20 to 30 minutes. Tastes even better the next day so no worry about leftovers. Prepare rice with no salt or butter. In a medium skillet, heat chicken broth until hot. Add green peppers and onions. Cook until tender. Remove skillet from heat and stir in corn and 1/2 salsa. Stir cooked rice and cheese into mixture. Spread each tortilla with 1/4 cup refried beans. Spoon 1/2 cup rice mixture along center. Roll up and place, seam side up, in a glass baking dish. Spoon remaining salsa on tortillas and cover with sour cream. Cover and bake at 400 degrees for 30 minutes. Preheat oven to 375 degrees. Rinse broccoli, cauliflower, and carrots; place wet on 2-quart baking dish. Bake until slightly tender, about 40 minutes. Combine remaining ingredients; sprinkle mixture over vegetables. Bake until crumbs are crisp and brown and vegetables are tender. Place macaroni in large bowl and while hot, add cheese. In separate bowl, combine remaining ingredients and add to macaroni mixture. Pour mixture into a casserole dish and bake for 30 to 45 minutes. Top with additional cheese, if desired. Preheat oven to 425ºF. Grease a 12 x 15-inch or larger baking sheet, or 12-inch pizza pan. Measure mix into a bowl. Add oil and water. Stir to form soft dough. Transfer dough onto baking sheet. Sprinkle with flour. Dip fingers in flour and pat dough into a circle about 11 to 12 inches across. Use more flour as needed. Crust will be thin. Spread pizza crust with tomato sauce. Leave about 1/2 inch around edge with no sauce. Top pizza with onion, oregano, and cheese. Bake 10–12 minutes until edges are brown and cheese is melted and starting to brown. Refrigerate any leftovers within 2 hours. Preheat oven to 400 degrees. Combine basil, oregano, garlic powder, and olive oil in a small bowl. Lightly brush one side of tortilla with mixture. Sprinkle equal amounts of meat, green pepper, and tomatoes over tortillas. Top with cheese. Place on middle rack in oven; bake for 8 minutes or until crisp. Saute onion in butter. Add tomatoes, seasonings, chicken, and olives; mix well. Simmer 10 minutes, stirring until slightly dry. Fill tortillas, top with cheese and roll. Place into baking dish and bake 350 degrees for 10 minutes. Serve with salsa and sour cream, if desired. Heat the broth, cumin, black pepper, onion and green pepper in a 3-quart saucepan over medium heat to a boil. Stir in the rice. Reduce heat to low. Cover and cook for 20 minutes or until rice is tender. Stir in the beans and chicken and cook until the mixture is heated through. Preheat oven to 350 degrees. Lightly grease a 9"X13" baking dish. In a large bowl, mix zucchini, biscuit mix, onion, salt, eggs, cheese, oil, and garlic. Spread mixture into prepared baking dish. Bake for 25 minutes, or until bubbly and lightly brown. Serve warm. Rinse lentils and then blend all ingredients except cheese together in a casserole dish. Cover and bake for 1-1/2 hours at 300 degrees. Add cheese during the last 20 minutes. NOTE: this dish fulfills being a complete protein and has additional nutrients from corn and tomatoes. Good served with buttered saltine crackers. In a large nonstick skillet, sauté green pepper, onion and garlic in oil for 3 minutes. Stir in broth, rice, cumin and turmeric; bring to a boil. Reduce heat; cover and simmer 15 minutes or until rice is tender. Add beans, tomatoes, chilies and corn; heat through. Serves 8. Preheat oven to 350 degrees. Lightly grease a 1-1/2 quart baking dish with cooking spray. Mix together the noodles, turkey, onions, green peppers, corn, cauliflower, broccoli, thyme, and pepper. Place in the baking dish; Top with bread crumbs. Bake until hot and bubbly, about 40 minutes. Preheat oven to 375 degrees. Coat a large saucepan with cooking spray and brown meat and onions. Stir in tomato sauce and Italian seasoning. Lower heat and simmer 10 minutes. In a medium saucepan, combine milk, water, and cream cheese. Add garlic and parsley flakes. Cook over medium heat, stirring constantly, unti cream cheese melts. Stir in cooked noodles. Pour noodles mixture into 8”x8” baking dish sprayed with olive oil cooking spray. Spread meat mixture evenly over noodle mixture. Sprinkle mozzarella. Bake uncovered 15 to 20minutes. Let sit 5minutes before serving. Preheat oven to 350 degrees. Lightly grease a 9"X13" baking dish. Combine all ingredients and mix well. Spread mixture into prepared baking dish. Bake for 35 to 45 minutes or until bubbly hot. In medium saucepan bring chicken broth to a boil. Add barley, return to boil, then cover and simmer about 45 minutes or until barley is tender and liquid is absorbed. Melt butter in skillet; add mushrooms and onions. Saute until onion is translucent. Add mushroom mixture to cooked barley. Mix in turkey, almonds, and sour cream. season with salt and pepper and turn mixture into oiled 2-quart casserole dish. Cover and bake at 350 degrees for 45 minutes. Combine cooked ground beef, soups, and milk in a large pot. stir over medium heat until mixture bubbles. Add bay leaves. Reduce heat to simmer and add sour cream and mushrooms. Add salt and pepper to taste. Combine cooked noodles and meat sauce. Remove bay leaves before serving. NOTE: Can use canned or leftover roast beef in place of ground beef. Preheat oven to 350 degrees. Brown ground beef in skillet. Add taco seasoning and water. Cook over medium-low heat for 3 minutes, stirring occasionally. Stir in beans, tomatoes, corn, and peas. Cook 3 minutes or until mixture is hot. Remove from heat; stir in cheese. Pour hot mixture into baking dish. Quickly top with cornbread batter and bake 30 minutes or until cornbread is golden brown and meat mixture is bubbly. Place roast beef in 1-quart casserole dish. Add onion, potatoes, and carrots. Mix remaining ingredients in a separate bowl and pour over top of beef and vegetables. Cover and bake at 350 degrees for 20 to 30 minutes or until potatoes and carrots are done. In 2-cup measuring cup, stir 1/3 cup water, the lemon juice, cornstarch, honey and lemon peel until cornstarch is dissolved; set aside. In 10-inch nonstick skillet, heat oil over medium-high heat. Add chicken; sprinkle with salt. Cook 2 to 3 minutes, stirring frequently, until chicken is brown. Stir in onions and bell pepper. Cook 2 to 4 minutes, stirring frequently, until chicken is no longer pink in center. Reduce heat to low. Stir lemon juice mixture in measuring cup. Pour into skillet; stir to coat chicken mixture. Cook until slightly thickened. Serve chicken mixture over rice.